Following earlier confirmation that the company was working on the project, Atari revealed the first images of its Ataribox console in July last year. Now, at San Francisco’s Game Developer Conference (GDC), the legendary games firm has revealed more info on its mysterious machine, including a new name: the Atari VCS. The company will show off the newly renamed console to the press at GDC this week, along with the Classic Joystick and the Modern Controller. As the names suggest, the former is a modern recreation of the Atari’s iconic, single-button joystick, while the latter is the firm’s take on a modern controller—one that features an Xbox One-style layout. The reason for the two differently designed peripherals is that those who want to play retro Atari games on the VCS will be best served using an original-style joystick. The gamepad, meanwhile, can be used for the few PC games it can run. The new console mixes classic and contemporary looks that were inspired by the 1977 Atari 2600’s wood finish. The machine's internals, however, are firmly set in the modern era. We know it contains a custom AMD processor, a Radeon GPU, and that the VCS is capable of running Linux. It also has an SD card slot, HDMI output, and four USB ports. Exactly when you’ll be able to order the VCS is unclear, but we’ll find out next month: Atari said it would announce the pre-order dates in April. These were supposed to start last December, but Atari delayed them as it wanted “more time to create the platform and ecosystem the Atari community deserves." Little else is known about the VCS, including the all-important game lineup. 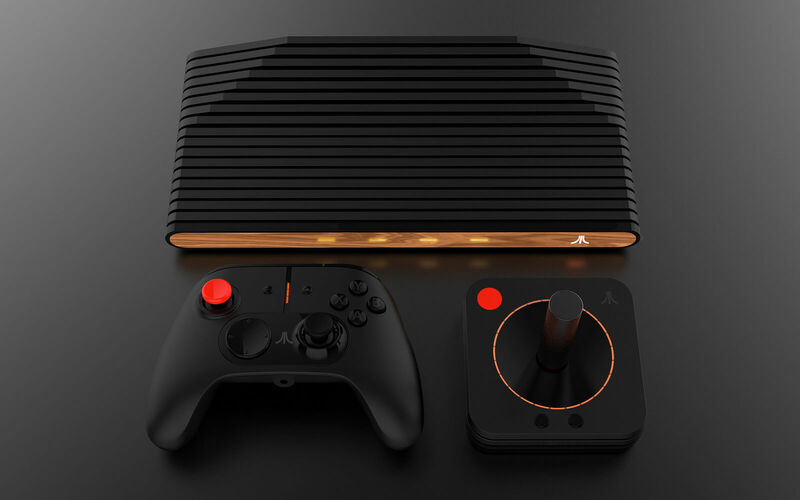 Atari did say it’s a new, connected device designed for today’s living room, rather than just a “retro box.” We’ll just have to wait and see if the console justifies its $250 - $300 price tag.